Welcome to Just Tyres Wakefield. Here at Just Tyres Wakefield, we only focus on selling tyres at great prices with excellent customer service. We have quality tyres available for hatchbacks, saloons, family cars, SUVs, 4x4s and vans, and our fitting centre is designed to ensure our customers' tyres are installed efficiently, using the very latest technology. Our tyre fitting centre in Wakefield is on Dewsbury Road and close to local amenities. If you are looking to buy tyres in Wakefield, we would be happy to help. Don't forget you can also pop in for a FREE Tyre Check where we can offer advice and assistance on any tyre queries you may have . If you would like to buy your tyres online and have them fitted at our tyre fitting centre in Wakefield, just click on the Buy Online image and book your fitting day and time during checkout. Just Tyres supply both fitted and delivered tyres in Wakefield. Our prices are regularly being updated and our lowest price guarantee sees us refund the difference for customers who have purchased a tyre from a competitor at a cheaper price. Whether you're looking for a tyre with a tread pattern that's specially designed to offer fuel efficiency, comfort or sharp braking, we have the complete range. 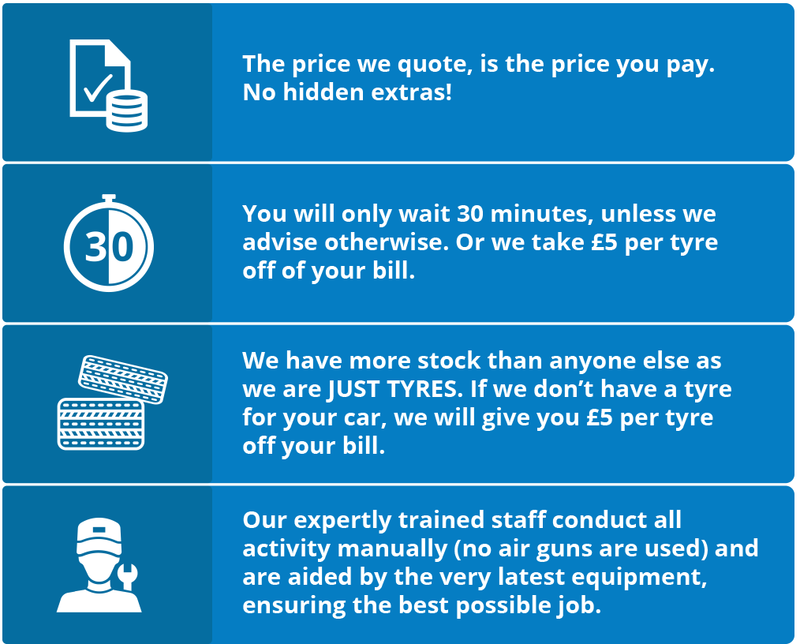 Our professional team always aim to fit our customers' tyres in less than 30 minutes, and we will take £5 per tyre off your bill if you're made to wait a minute longer. There are plenty of premium and super premium brands to choose between on our websites, and you can decide between tread patterns offering reduced rolling resistance and reduced CO2 emissions. Our super premium brands include models with high mileage potential, and you can get a quiet and comfortable ride as well as precise handling driving stability. To find the most relevant tyres in Wakefield for your car, simply enter your tyre details on our website. Super value tyre brands do vary depending on your tyre's size, but you always get good quality at the lowest possible price. We also regularly update our special offers, but these aren't always available for long periods so take advantage of them while you can. You can find your nearest fitting centre by entering your postcode on our fitting centre details page, and our system will provide you with the location, telephone number and opening times. If you need any help choosing a tyre for your car then you only need to get in touch with us on 0845 456 9903. Alternatively, feel free to send us an email on customerservices@justtyres.com and a member of our team can guide you through the most suitable options.